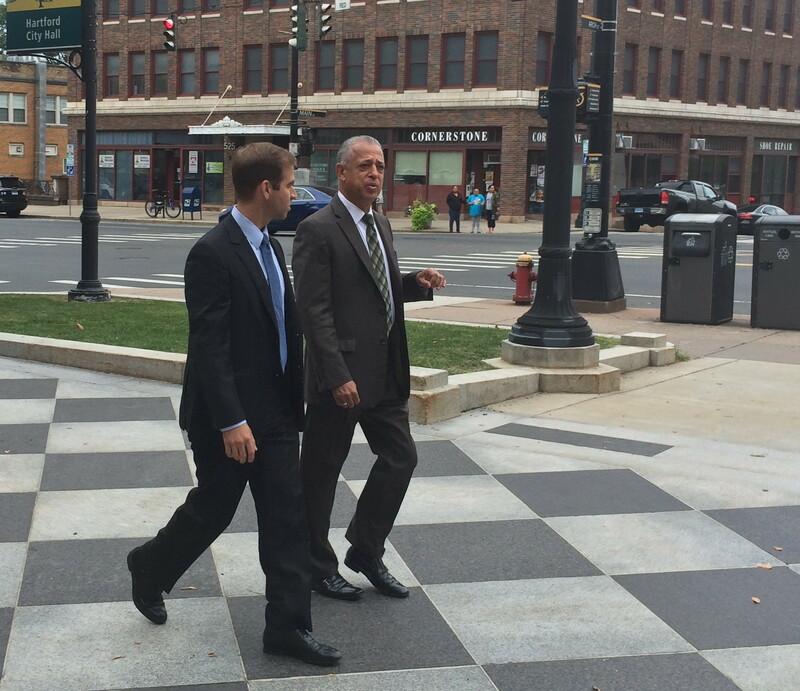 Luke Bronin and his former boss, Gov Dannel P. Malloy, in Hartford this week. The great political seducers, ambition and opportunity, are double-teaming Hartford’s first-term mayor, Luke Bronin, tempting him with a weak field in an open race for governor. He must decide if they speak louder than the promise he made two years ago to serve a full term if voters entrusted him with the job of stabilizing Connecticut’s struggling capital. 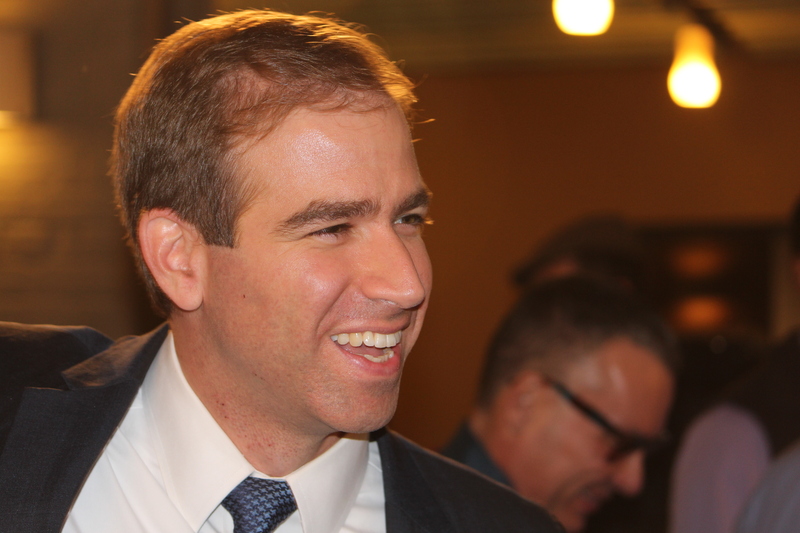 If he runs, the 38-year-old Bronin will face hard questions on day one, the first being: How do you square a gubernatorial campaign in 2018 with your promise in 2015 to keep to the hard work of fixing Hartford for four years and beyond? His answer today is a work in progress. Open races for governor generally attract throngs of candidates. Top-tier Democrats, those who have won other statewide or congressional offices, have taken a pass. Attorney General George Jepsen took a perfunctory look. Comptroller Kevin P. Lembo started raising money for a potential run, then declared he would seek a third term as comptroller. Bronin, who won’t complete his second year as mayor until New Year’s Day, has been quietly assessing the pros and cons of a gubernatorial run for months, a theoretical exercise that took on new urgency with the announcement last week by Lt. Gov. Nancy Wyman that she would not try to succeed Gov. Dannel P. Malloy in 2018. Susan Bysiewicz, the former secretary of the state whose career famously derailed in 2010, is talking to Democrats about a possible run. So is Rep. William Tong of Stamford, whose ambitions previously led him to unsuccessful bids for the Democratic nominations for U.S. Senate in 2012 and mayor in 2013. On the Republican side, House Minority Leader Themis Klarides of Derby has not ruled out joining a much larger GOP field. Luke Bronin at his victory celebration in 2015. Their ruminations are evidence of the rarity of opportunities presented by the 2018 race for governor. Not only does the field lack an incumbent, there is broad consensus that no one in either party is showing signs of emerging as a front runner, with barely six months until nominating conventions and less than a year before the election. Middletown Mayor Dan Drew, a Democrat who began raising money for a gubernatorial campaign three months before Malloy’s retirement announcement in April, said he was not discouraged by the prospect of more competition, nor insulted by the underlying premise that the current field is lacking. Of the five Democrats who have raised significant funds, Drew is the only declared candidate. The others have exploratory committees. They are: Dita Bhargava of Greenwich, Bridgeport Mayor Joe Ganim, former state Sen. Jonathan Harris of West Hartford, and Chris Mattei of Hartford. Bhargava and Mattei never have held office and would be the first candidates in modern political history to win a Democratic gubernatorial nomination in Connecticut without prior elective experience. Bhargava, a former Wall Street executive, ran unsuccessfully for state representative and briefly served as vice chair of the Democratic State Central Committee. Mattei is a former federal prosecutor. Bronin’s entrance into the race would be a blow to Mattei, who had hopes of going to the convention with the backing of the city’s delegation. Mattei, a personal acquaintance of the mayor’s, declined to say if he began his explorations with an understanding that Bronin was not interested. Every potential candidate faces three questions: Can they run and compete for the nomination? Can they make a case beyond their base to the general electorate? Sometimes, the more difficult question about candidates is one Democrats are asking about Bronin: Even if they can credibly run, should they? Interviews with political operatives, officials and activists find a consensus that Bronin certainly can credibly compete for the nomination. A Hartford political base provides a head start on the first challenge: winning at least 15 percent of the vote at a nominating convention, the threshold to qualify for a primary in August. One Republican campaign consultant insisted Bronin has nothing to lose by running, noting that he still would be mayor. But Democrats in Hartford say that if Bronin runs and loses, his ability to seek re-election as mayor in 2019 will be compromised. Opinions were mixed, at best, on whether Bronin could convince voters he was ready to run for governor during his first term as mayor. Even admirers of Bronin, most of whom declined to be quoted by name, said he risked being seen as an opportunist, someone more interested in advancement than completing a difficult job. Another consultant noted that Bill Clinton promised Arkansas voters he would not run for president in 1992 if they re-elected him governor in 1990. But Clinton served 10 years as governor. A fellow mayor and potential Republican rival for governor, Mark Boughton of Danbury, said Bronin ran as an insurgent in 2015, unseating a Democratic incumbent in a primary and promising to tackle Hartford’s seemingly bottomless well of challenges. Bronin was greeted at city hall by a $48 million deficit, unaffordable labor contracts, and looming debt payments the city was unable to pay, raising the possibility the new mayor would have to seek relief from the U.S. Bankruptcy Court, a first for a state capital. Half the property in Hartford is tax-exempt. The recently approved state budget stabilizes the city’s finances, at least in the short term, by giving the state’s backing to a refinancing of Hartford’s debt and providing $20 million to help cover interest payments. It also creates a Municipal Assistance Review Board with powers to advise municipalities or take over their finances, depending on how they fall in a four-tier scale of fiscal distress. Hartford is expected to be initially rated as a tier 3 city, one level short of ceding control of its finances and collective bargaining to the review board. But it means the mayor and the city will have to establish a working relationship with a board that will offer advice and monitor compliance with a three-year financial plan on a monthly basis. Bronin can say that he’s made progress, but how much? 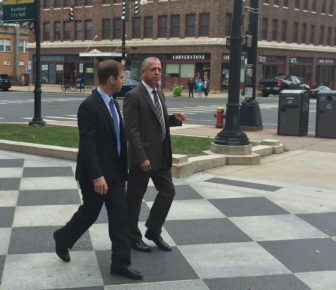 Luke Bronin and Mayor Pedro Segarra after Bronin won the 2015 primary and Segarra endorsed him. He has downsized city government and obtained labor concessions, a helpful talking point in a general election, less so in a Democratic primary. But those changes, as well as the assistance from the state, are only a beginning to addressing the city’s structural problems. To use his own imagery, he’s laid a foundation. Bronin said his candidacy for governor would be a boon to Hartford, not a betrayal. “As mayor of the capital city, I have seen how much Hartford’s future and the future of all the cities and towns are tied to the future of the state,” Bronin said. Bronin would bring a stellar resume to the race. He is a Yale-educated lawyer and a Rhodes Scholar with a master’s degree from Oxford who served as a Naval officer in Afghanistan and a treasury official in the Obama administration. He also has served Malloy, who seems on track to leave office with one of the lowest approval ratings of any U.S. governor. He was the deputy manager of Malloy’s first, unsuccessful campaign for governor in 2006. After his return to Connecticut, Bronin was Malloy’s general counsel for two years, beginning in January 2013. Malloy has said nothing publicly about the possibility of Bronin trying to succeed him. But associates of the governor say he never has viewed Hartford’s city hall as a reliable path to higher office for Bronin or anyone else. His wariness was apparent in comments he made to the Hartford Courant about Bronin in April 2016, when the new mayor was about to propose his first budget. Take out three lieutenant governors who took office upon the resignation of a governor, every governor elected since 1950 either has had service in Congress or a previous statewide campaign. Many had both. 2010 Dannel P. Malloy Stamford mayor Lost the 2006 primary for governor. 1994 John G. Rowland U.S. House, General Assembly Lost the 1990 election for governor. 1990 Lowell P. Weicker Jr. U.S. Senate, U.S. House, General Assembly Won races for U.S. Senate in 1970, 1976 and 1982, and lost in 1988. 1978 Ella T. Grasso U.S. House, secretary of the state, General Assembly Won races for secretary of the state in 1958, 1962 and 1966.